In 1981 I was on holiday in Suffolk, England, when I found a commemorative stone with an intriguing story carved on it, in the churchyard of St. Edmund Church, Southwold. The inscription on it led me to a history trail that stretched from the coastal town of Southwold to the Gulf of Florida in America, and on to Charleston in South Carolina. It led to a tale of piracy, betrayal, murder – and eventually retribution for the pirates. However, it was only recently I could write the last ‘justice’ chapter of this true story. Images: Introduction photo taken by my brother, David Neville. Other images purchased by me from Shutterstock. on board the ‘Ann’, West-Indiaman on 28th June 1819. By hands of treacherous pirates lo! he dies. I was on holiday in the town; the year 1981. Intrigued by inscription on the stone, I enquired at the vicarage, but the curate did not know the story behind the inscription. Neither did the local librarian, nor the small town museum curator; it appeared that no one had previously researched the story, accepting that danger and sudden death at sea were commonplace then. This set me off on a history trail involving enquiries in London at the National Maritime Museum, and eventually with the Charleston Library Society and Federal Archives Center in Georgia, USA. As this was done pre-internet, this involved me in typing out lengthy letters, sending them by post, and then awaiting postal replies, which included photocopies of archive documents. After six months, and thanks to some painstaking effort by the staff at the Federal Archives, I managed to piece together the story that follows. David May was born in Southwold (pictured right) in 1788, the second eldest son of Henry and Lydia. The May family had strong working links with the sea and David followed in the family tradition. He joined the merchant service and by 1819 had risen to the position of Mate aboard the Ann of Scarborough, a brig registered at the Port of London. On the 26th June, 1819, the Ann left Matanzas, Cuba, bound for Falmouth, England, with a cargo of sugar and coffee. 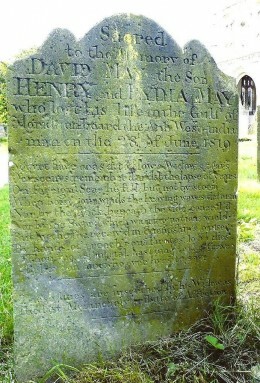 The Master of the ship was Thomas Sunley, with a crew of ten, including David May. On the third day at sea, off the coast of Florida, a small boat containing eight men was spotted, apparently in distress. The Ann drew alongside and the men in the small boat asked for a rope to be given to help them with repairs. As this was being lowered to them, they suddenly rushed on board armed with cutlasses, muskets and pistols. The crew of the Ann, taken by surprise, were driven forward, but in the resulting confusion, the ship’s cabin boy fled and hid. The Ann was now in the hands of pirates. From the 17th to early 19th centuries, scores of pirate vessels operated around the West Indies and American coastline. Their ships were fast and easily overtook their prey at sea. Piracy in the area was at its peak in the late 17th century when many privateers (the equivalent of sea-going mercenararies) took to pirating in the absence of wars to fight. Determined efforts by both the American and English navies had driven many of the pirates out, but in the early 19th century they were back in force. The ending of the Napoleonic War and Latin American wars of liberation again left thousands of privateers out of work. At the same time, increased trade between Britain and the West Indies swelled the Atlantic and American coastal lanes with merchant vessels. The pirates, operating from coves and bays of Cuba and Puerto Rico, became increasingly more aggressive and ruthless in their operations. On board the Ann the leader of the raiding gang was a man the others called ‘Peter’, described as ‘stout, black-whiskers, tall, and a daring-looking fellow’. He demanded that Captain Sunley hand over all the money on board. But Sunley shook his head; there was no money, it had all been spent purchasing the cargo. At this point, the pirate vessel, the sloop Mary of Moorle, (alias the Black Jake), came into view. Both vessels were about sixty miles off the Florida coastline. Captain Sunley and six of his men were taken on board the pirate vessel to be confronted by a John Furlong (alias John Hobson), the pirate captain, later described as a ‘little short man, pitted with smallpox, and with large whiskers.’ Furlong threatened Captain Sunley with a pistol and again demanded to know where the money was hidden, but Sunley’s answer was the same as before; there was no money on the ship. The pirate captain decided to question the crew of the Ann instead ,and one by one they were interrogated. Soon it was the turn of crewman, Thomas Newton, a nephew of Captain Sunley, to be brought before Furlong. The pirate captain stuck a loaded pistol in Newton’s chest and repeated his question. The terrified Newton revealed that his uncle had five doubloons and some dollars concealed and offered to show where the money was hidden. The money was found and the crew of the Ann, including the cabin boy discovered in his hiding place, were rounded up. The eleven captives were given an ultimatum: join and help the pirates – or die. Newton and five others joined the pirates. Four men refused: Captain Sunley, David May, William Quince, ship’s carpenter, John Hall, the ship’s cook. What made the four men refuse? Family honour, a sense of outrage at losing their ship, revulsion at the prospect of becoming a pirate? Whatever their reason, these men knew they would die. A fifth crewman, too sick to be of any use to the pirates was also dragged to the deck. Furlong shot Captain Sunley in the heart with a pistol. He then shot David May in the head. Other members of the pirate crew opened fire with muskets on the other three men. All the bodies were flung overboard. The remainder of the crew ran the Ann into the Florida shore and the pirates cut away the topmasts and yards and opened the hatches to give the appearance it had been wrecked. The cargo was transferred to the pirate vessel and all evidence of their aggressive activity removed: carriage guns, muskets, cutlasses and boarding pikes were abandoned on the shore. The pirates split up and Furlong and a few of his men left in their vessel; another group left the scene in the yawl from the Ann, and a third group, including Newton, remained on the shore and were later picked up by a passing schooner. Furlong and his pirate crew sailed to Charleston in South Carolina, and there Furlong reported that: ‘on the 14th July, near Musquito, he fell in with a schooner not having a single person on board and that he took off a load of coffee in bulk and proceeded to this place’, evidently with the aim of claiming a reward for the shipment. The authorities though were suspicious, and began to question other crew members. Newton, by this time, had told his version of events, and the news of this reached Charleston. Furlong and seven of his pirate crew were arrested. During their confinement at Charleston goal they attempted to escape by making a hole and passage through the ceiling of their cell. But they were caught in the act and in December 1819, Furlong and three other pirates were tried at Charleston for murder; two other crewmen were also indicted for piracy, but no evidence was offered by the District Attorney on the charge of murder and they were tried separately for piracy the following year. 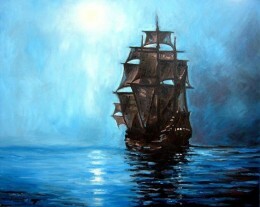 Other pirate crewmen were released on the grounds they had been pressed into piracy against their will. Thomas Newton gave evidence against Furlong at the trial. By December 1981, my research had run out of steam. It had taken me six months by airmail correspondence with the authorities in America to learn about the arrest of the pirates. I had fitted in the research around my full time job, and other work related projects were pressing in on me. I wrote up what I had learned about the incident and gave the information to the Southwold library service. I stuffed all the documents in a box and forgot about them. However, when I moved house recently I rediscovered the documents and this reawoke my curiosity. What had happened to the pirate captain, John Furlong, and his crew? I was now retired so had more time to find out and bring closure to the story. This time, however, the internet helped me to discover in hours, rather than months, what I wanted to know. An online search revealed that on the 29th April 1820, John Furlong, pirate, was publicly hanged at Charleston in the presence of the three other condemned pirates, who were still awaiting final confirmation of their own death sentences (which followed in June of that year). He (Furlong) was accompanied to the place of execution by the Rev. Dr. Gallagher, of the Roman Catholic Church, who was an instrument, we hope, in opening his eyes to the prospect of another and better world. 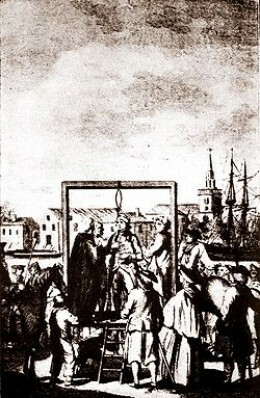 At the gallows, both joined in prayer and fervently implored mercy and forgiveness from the Throne of Divine Grace, although the crime for which he suffered was of the most aggravated and black estate. He appeared to resign life with the utmost composure, and while standing between a temporal and an eternal world, he wisely observed to all around him the necessity of thinking twice before acting once. The crowd of spectators was very numerous and the scene awfully impressive. He was executed near the jail. May this example prove a warning to the unpardonable crime of Piracy and a terror to all evil doers, as Justice has at last unsheathed her sword. Very interesting article. I love that you did so much research after seeing the stone. We’ll often have our curiosity roused when we see or read something, but few of us take it further to get the details. So pleased that you did! Thanks Merry. I really enjoy this type of research, particularly unearthing stories about people who otherwise would sink into history unremembered. David May, in particular, was a very brave man in the face of certain death, so his story deserves to be told.